"The One who Enrolls is the One who Controls"
What is the next wave in payments, and how will it impact your business? Crone Consulting LLC assists management teams in transforming payments from a cost of doing business to a revenue-generating new line of business. When you control the user interface, you control your destiny for providing value added services for your customers, and the associated revenues that follow. This mindset is transformative for every business, and requires the engagement of every functional discipline to maximize the cross-channel enhancements that are powered by the mobile interface. Mobile payment is not just about payment, it is a marketing platform that links your company and your most loyal customers at a transformative point in the shopping cycle. It is also about harnessing and protecting your data, especially customer and transaction data. Mobile payment at the point of sale, controlled inside a retailer's or bank's own mobile app, can be used to reduce costs and leverage real credentials, recorded transactions and stated preferences with other “Big Data” such as location, timing, social postings, etc. to improve marketing and sales by making the customer known and contactable. 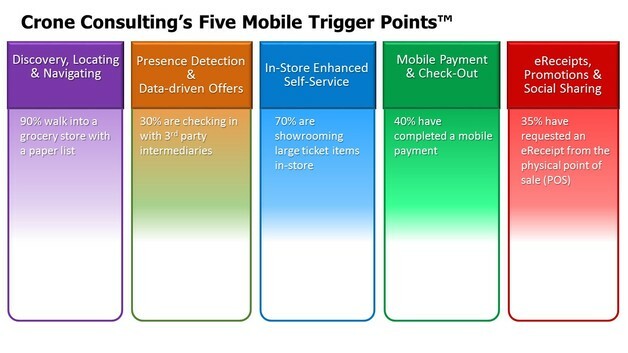 While each trigger point represents opportunities for retailers, banks, and others, as well as meaningful risks of disintermediation, Mobile Payment & Check-out is the foundation that enables real customer interaction and ongoing communications, enabling a new era of targeted and customized marketing and service. Located in the heart of the Silicon Valley, California, Crone Consulting LLC has developed the Customer Self-Service (CSS) and mobile strategy for many of the biggest players in the ecosystem including all types of financial institutions, core processors, retailers, wireless carriers, handset makers, recurring billers, credit & debit card issuers, networks, and the like. Founded by Richard K. Crone, a noted expert in the payments business for over 30 years, Crone Consulting LLC helps companies unlock the power of mobile and electronic payments to create strategic advantage in the financial services and retail marketplace. Managing Partner Heidi Liebenguth with a team of expert specialists bring extensive current experience in mobile customer self-service and shopping, mobile banking and payments, as well as all forms of electronic payments. Crone Consulting, LLC, offers a wealth of knowledge to financial institutions, retailers, data processors, mobile carriers, payments providers and investors. Check out the On the Road/In the News Page to see current conferences and other activities in mobile payments.